Pop Quiz: How Much Do You Know About Dentistry?? Here at Montgomery Dentistry, we love to have fun! So, we've created this fun pop quiz to test your dental knowledge. Some of the answers might surprise you! And don't worry, there's an answer key at the bottom of the quiz. No cheating, though! Dental hygiene is anything but a modern-day concept. Fresh breath and clean teeth have been coveted by all types of people for thousands of years! Albeit, practice and technology have certainly changed and progressed. What began as a "chew stick" over 5000 years ago has now become the tool universally known as the "toothbrush." The history of this staple of dental hygiene has a fascinating and surprising history! Here at Montgomery Dentistry, we are passionate about eating. Why do you think we care so much about healthy teeth? :) Our very own Betty Karle has shared a recipe for a delicious vegetable pizza. It's great for parties, tailgates, and cookouts. It's a must have at our office luncheons. Enjoy! There is a fascinating list of household celebrity names that deserve recognition beyond what they are ultimately famous for. Here at Montgomery Dentistry, we would like to offer you a more well-rounded view of some of our most beloved celebrities who also dabbled in dentistry! We here at Montgomery Dentistry know how drastically the health of your teeth and gums can affect your quality of life. When your teeth are straight and white, you feel beautiful and confident! When your gums are healthy, you can brush and floss without any discomfort! And when your teeth are strong and well maintained, you are freed up to use them for their intended purpose…to EAT! Real life is typically nothing like the movies. Who has time to pause right before they jump into a dangerous situation to save someone and say something really cool and intense? And there is no such thing as an “ugly” girl who takes off her glasses and all of a sudden she is thought to be gorgeous. And, unfortunately, some things just aren’t as “romantic” as the movies portray. Hollywood often creates a beautiful scene of a handsome husband waking up next to his beautiful wife and giving her a lovely “good morning” kiss. But, here on earth, we all know what reality is. A good brushing (or at the very least, mouthwash) MUST precede any “good morning” kiss. Bad breath…it plagues even the best of us. Why Does The Dentist Monitor My Blood Pressure? ​A common question that we are asked here at Montgomery Dentistry is why we take a patient’s blood pressure for a procedure as simple as a check-up. Isn’t it a little unnecessary to have your blood pressure monitored, when all we are going to do is clean your teeth? Not at all. Your child’s life is probably filled with things that he or she naturally sees as fun or exciting. For instance, no one has to teach their child to jump into a mud puddle…they instinctively seem to know that getting muddy is awesome. Toddlers and young children often display some pretty cute behavior that, unfortunately, isn’t quite as cute once they are older. Smearing dinner all over their face. Wearing any article of clothing backwards. Repeating everything Mommy and Daddy say. Sucking their thumbs. Parents of toddlers know that learning opportunities come in all shapes and sizes! The perfect “teaching time” rarely involves your preschooler sitting quietly at the dinner table; rather, fun little lessons often occur smack in the middle of chaos and mess! Adding Smiles to Our Team! ​Please join us in welcoming Joyce Smith and Brittni Chambers to our team. Congratulations! We wish you the best. We want to congratulate Haleigh and Teddy Barrera on the recent birth of their son Tatum Reid, 8 lbs. 4 oz. and 19 in. long. Haleigh has decided to stay home for a time with her son. Her last day was February 14, 2013. Also, we want to congratulate Syndal and Justin Miller on their recent marriage. Syndal will be moving to Tuscaloosa with her husband who is studying accounting at The University of Alabama. Her last day with us was June 4, 2013. I hope everyone had a wonderful Thanksgiving and that you are planning a great upcoming holiday season. There are several things happening at Montgomery Dentistry that I wish to tell you. First Visit: When should I take my child to see the dentist for the first time? Shortly after becoming a parent, it's natural to start asking questions: What school should they attend, what doctor should we use, what immunizations should we get? But... have you ever wondered, when should I take my child to see the dentist for the first time? 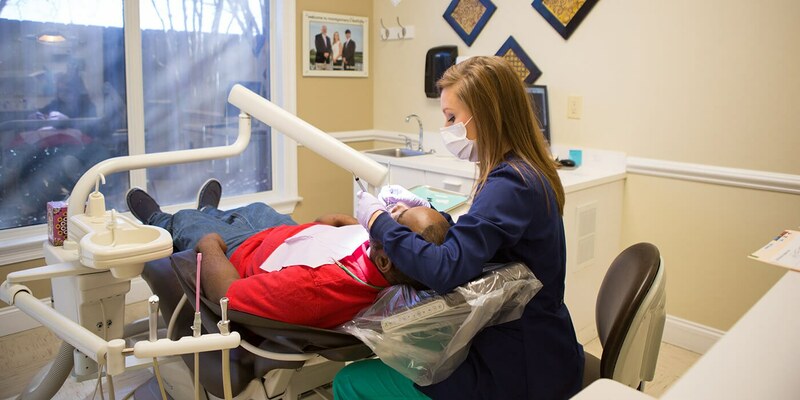 ​We love our service members and are proud to announce that we can continue to serve them even with the recent changes with The Tricare Dental Program (TDP).